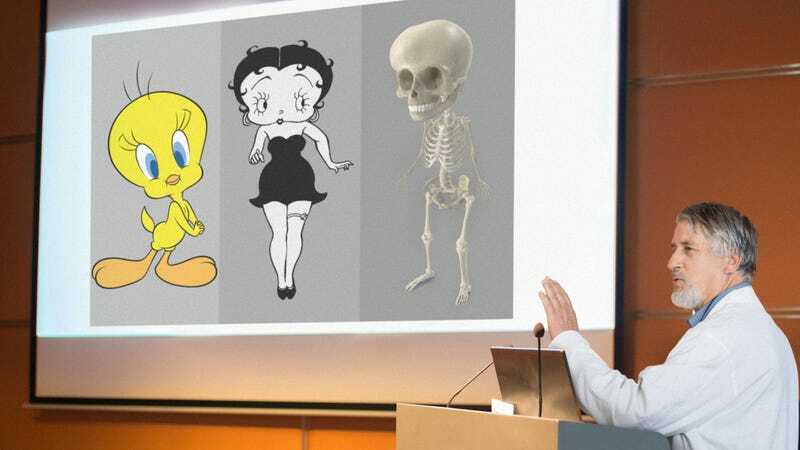 This is truly an amazing day for science: A team of medical researchers at Harvard has announced that Tweety Bird and Betty Boop have the exact same skeleton, just different skin. To complete the study, which was published earlier this week in the influential peer-reviewed journal Nature, scientists conducted a meticulous analysis of every single bone in Betty Boop and Tweety Bird’s bodies, from their extremely bulbous hip bones to the unique vertebrae structure that makes it look like both characters’ necks are basically absent. In every case, they found that Betty Boop and Tweety Bird both have the exact same number of bones, and that each bone is the exact same size. The study has also found that if you plucked out Tweety Bird’s feathers, he would look like a clone of Betty Boop, and, conversely, if you tarred and feathered Betty Boop, she would look like a clone of Tweety Bird. This is a pretty amazing moment in the history of science, and leading biologists are already hailing the discovery of as a completely revolutionary moment for the field. It’s safe to say that this watershed study of Betty Boop and Tweety Bird’s identical bone structures will change the way that scientists study their anatomy for years to come. How Many Of These Classic Comic Strips Have You Read?